The path to WSOPE glory will again take players to the Casino Barrière de Cannes Croisette in 2012. With this summer's 2012 World Series of Poker in Las Vegas fast approaching, the WSOP recently announced the schedule for this year's WSOP Europe series of events to take place in late September and early October. 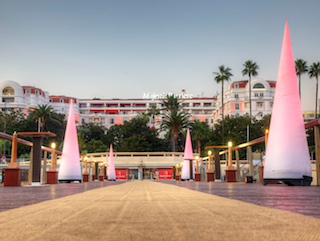 After a successful seven-event series last fall, the WSOPE will return to Cannes, France to the Casino Barrière de Cannes Croisette for another seven-event series. This will mark the sixth year of the WSOPE which debuted in 2007 at the Casino at the Empire in London with a schedule of three bracelet events. Annette Obrestad won the inaugural WSOPE Main Event that year, besting a field of 362 in the £10,000 buy-in no-limit hold'em tournament a day before her 19th birthday. After seeing three years of growth in London, the WSOPE made the move to Cannes last October where record-breaking numbers came out for poker south-of-France-style. The seven bracelet events drew nearly 2,600 entrees, with Elio Fox outlasting a record-setting Main Event field of 593 to claim the bracelet and €1.4 million first prize. When announcing this year's WSOPE schedule, Ty Stewart, Executive Director of the WSOP and Vice President of Caesars Interactive Entertainment, noted how events had been moved a few weeks earlier this time around "to take advantage of the great weather and all Cannes has to offer," adding that some are already speculating that this year's Main Event (a €10,000 + €450 event) might actually draw more than 1,000 players. The 2012 WSOPE will follow the same schedule as last year, featuring the same seven events with nearly the same buy-ins. Here are the seven events with starting dates: September 21, 2012 Event No. 1 (3-day), €2,500 + €200 No-Limit Hold'em (6-max.) September 22, 2012 Event No. 2 (5-day), €1,000 + €100 No-Limit Hold'em September 24, 2012 Event No. 3 (3-day), €5,000 + €300 Pot-Limit Omaha September 25, 2012 Event No. 4 (3-day), €3,000 + €250 No-Limit Hold'em Shootout September 26, 2012 Event No. 5 (4-day), €10,000 + €450 No-Limit Hold'em Split Format September 27, 2012 Event No. 6 (3-day), €1,500 + €150 Pot-Limit Omaha (6-max.) September 29, 2012 Event No. 7 (5-day), €10,000 + €450 No-Limit Hold'em Main Event Join Betfair Poker Now. When announcing this year's WSOPE schedule, Ty Stewart, Executive Director of the WSOP and Vice President of Caesars Interactive Entertainment, noted how some are already speculating that this year's Main Event (a €10,000 + €450 event) might actually draw more than 1,000 players.